While the growth in loan approvals has slowed, analysts point out that the second quarter is usually a slow one for housing growth. Taking loans sold into consideration, the y-o-y growth in loans to individuals rose by 15.4%, while loans to corporate bodies, albeit on a much lower base, went up by 25.8%. But this is unlikely to be the trend going ahead, as growth in individual housing loans starts to pick up. On a sequential basis, compared with the June quarter, the growth in individual loan approvals and disbursements for the second quarter of this financial year has been 26% and 24% respectively. Higher dividend income and fees also helped boost earnings, as did profit on sale of investments. The company also kept a tight leash on expenditure—for example, staff expenses during the quarter were lower than in the year ago period. The upshot was a 24.2% y-o-y rise in net profit in the September quarter, compared with a 20.6% increase during the June quarter. The firm’s asset quality remains excellent, at 0.95% compared with 0.98% at June-end. But HDFC is not just a mortgage lender—much of its value comes from being a holding company. 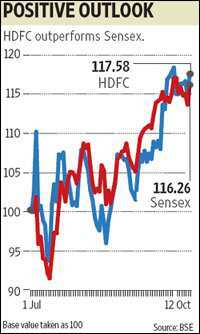 Analysts say that HDFC Bank’s substantial branch expansion, which will increase the scope for selling HDFC products, has been a positive for the stock. Similarly, any progress on increasing foreign investment limits for insurance will act as another kicker.